Cast: Arjun Kapoor, Alia Bhatt, Ronit Roy, Amrita Singh, Shiv Kumar Subramaniam, Revathy, Sharang Natarajan, Ankit Chitral. On some level it’s hard to relate to 2 States, especially in this day and age. The film, based on a novel of the same name by Chetan Bhagat, which recounts the story of a young couple who’s romance buckles under from the fact that they’re from two different states in India, on paper at least, has very little going for it – so much so that one wonders how it made an entire book, let alone a motion picture! And yet, Abhishek Varman’s directorial debut has such a distinct freshness about it that even though its culmination has absolutely no element of surprise to it, you go along for the ride simply because of its feel good factor, zesty music, unanimously charming performances and essentially, all the elements that you’d expect from a youthful romcom. The story (recited in flashbacks on a shrink's couch) kicks off at the Indian Institute of Management in Ahmedabad, where a goofy, earnest Punjabi 'munda' Krish Malhotra (Kapoor), sets his sights on Ananya Swaminathan (Bhatt), a fiery Madrasi chick with oodles of attitude. They hit it off and inevitably fall in love, spending almost the entire course of their time at the institute together. Krish, realising he can’t bear to live without her post graduation, proposes to Ananya and she accepts. But its the aftermath that inadvertently proves to be a hindrance as neither Ananya’s simple, stoic Brahmin parents (Revathy and Shiv Kumar Subramaniam), and nor Krish’s loud, brash mother (Amrita Singh) are keen on the match. And thus begins a battle of wits and a test to win over their respective in laws, whilst ensuring that their fragile relationship is able to withstand, the subsequent pressures, the clash of cultural complications and the distance between them. At face value, 2 States abounds with clichés, but what sets it apart is perhaps the way in which director Varman handles the complexities of the relationships, the way in which the screenplay is executed, and the way in which he infuses an old world charm into the romance, and the characters, which however flawed, will have you rooting for them right till the end. The credit for that however, shouldn't lie entirely with him. The polished and lavish Dharma production values along with Karan Johar's stamp at various points in the film are unmistakable. It's not just behind the scenes though. Varman is aided immensely by able performances from the film's principal cast too, which range from good to terrific. Without sounding disrespectful, Arjun Kapoor has a certain middle class likeability about him. He’s goofy, earnest, rooted and much like his character, isn’t larger than life. As such, his Krish is extremely believable and is a complete departure from the characters he’s portrayed till date. He may not have the obvious good looks, but there's a certain vulnerability about him, which is extremely endearing. Alia Bhatt is fast becoming a favourite and is easily the best thing about the film. Luminous, radiant and spunky, as Ananya she makes you marvel at her range – first Highway and now 2 States. She looks gob-smackingly breathtaking too, so if ever you get bored you can just gawk at the way she’s been styled in the film. The supporting cast is equally good. Revathy and Amrita Singh are both in fine form – one a subtle epitome of grace and dignity, while the other a loud, brash and irritating woman albeit with a soft interior. And special mention of that charming scene in which Revathy's character croons 'Saathiya yeh tune kya kiya' from her debut film Love with Salman Khan in the early 90s. Bollywood old scholars will remember that one for sure! Ronit Roy as Krish's repenting alcoholic dad and Shiv Kumar Subramaniam provide able support too and are effortlessly natural, even if they're relegated to the sidelines at times. 2 States would have been a great film had it not been for a few inconsistencies. For instance, Krish and Ananya go on and on about parental approval and yet, they don’t bat an eyelid while indulging in pre-marital romps and stolen snogs under the duvets. If they are really that modern, why the obsessive need to seek approval? It doesn’t quite make sense and their motives seem superficial and never quite add up in that sense. 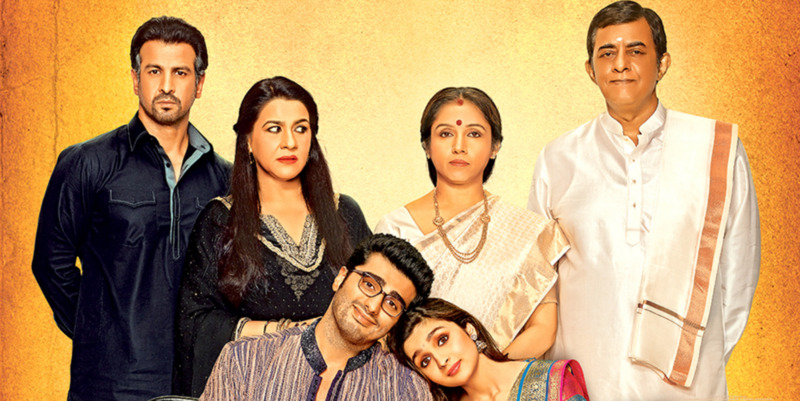 Superficiality and a few other niggles aside (namely the film's length and the subplot involving Krish and the brewing tension between his father), 2 States works on many levels. The performances, the romance, the dry humour, the effervescence and the raw charm of the young leads raise the bar of the film above the mundane and make it a fun watch, even if its overall plot rests on a flimsy premise. I’m going with three and a half stars. A truly outstanding work of art that should not be missed.